As you walk into the main barn, Mr. Personality, (I mean Robin) will be sure to grab your attention. His larger than life personality will be sure to make you smile. His intuition is beyond special; he knows how to connect to riders and clients of EAP in an exceptional way. He is the second largest of our heros here at HDH. Robin is a 22 year old quarter horse. He was donated by Betty and Irvin Keel of Jupiter Farms along with his best friend Blaze when he was 10 years old. Thank you, Betty and Irvin. Your boys do an amazing job here and are well loved! He is truly a special man who wears many hats. He loves his job whether it be being ridden by a child who is riding independent for the first time; or being a part of the Equine Assisted Psychotherapy program and encouraging a child to open up in therapy for the first time. Robin’s beautiful red coat has a year round allergy to gnats. He is treated with Major's Solution internally and externally two times a day. All volunteers and even some riders are taught to care for his affected areas, Robin sees this as a great time for bonding and loves his personal massages. Thank You Major's Solution for donating! Gaining trust in life can be hard. Being intimidated in school and the work place happens. But Robin knows how to help. Although some can be taken a back by his size, Robin is well known for gently teaching how to gain trust in one another and confidence in oneself. Hand grazing after a bath and a photo op with bunny ears is a great way to bond with a horse! 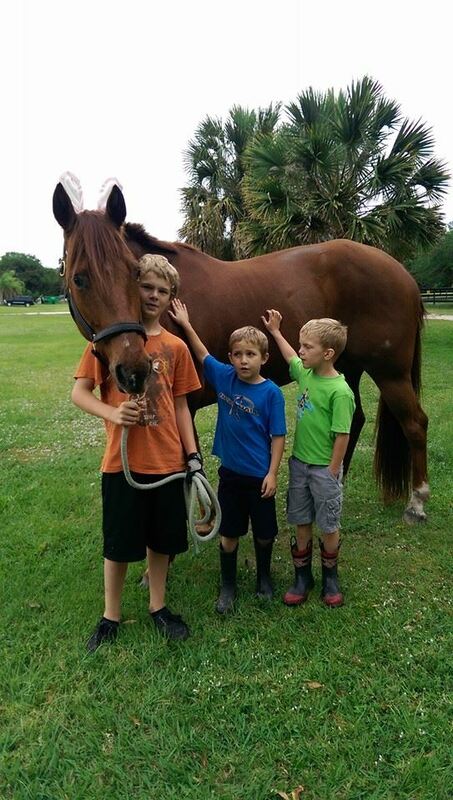 We let our students and volunteers spend as much time bonding with the horses as possible. Learning to take care of one another is so important in life, at HDH we all have each others backs!